Match three or more colored eggs! Hatch and collect trophy creatures which are hidden behind certain levels. Boost your karma and dominate the leaderboards! Enjoy! 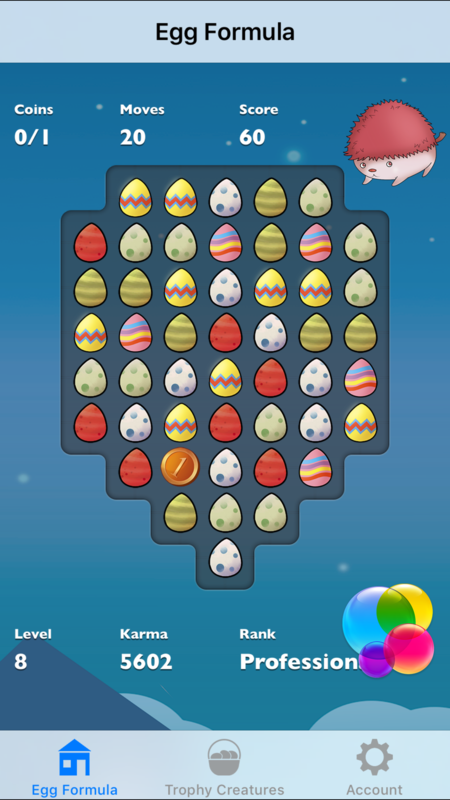 Egg Formula is a turn based match 3 puzzle adventure egg game. Switch and match three or more eggs in a row or column. The level is completed when you reach a given number of points OR break all ice tiles OR bring down all coins within a given number of moves. It depends on level's objective. There are 4 possible level's objectives for each level: earn points, break ice, break ice PLUS earn points, bring down coins. 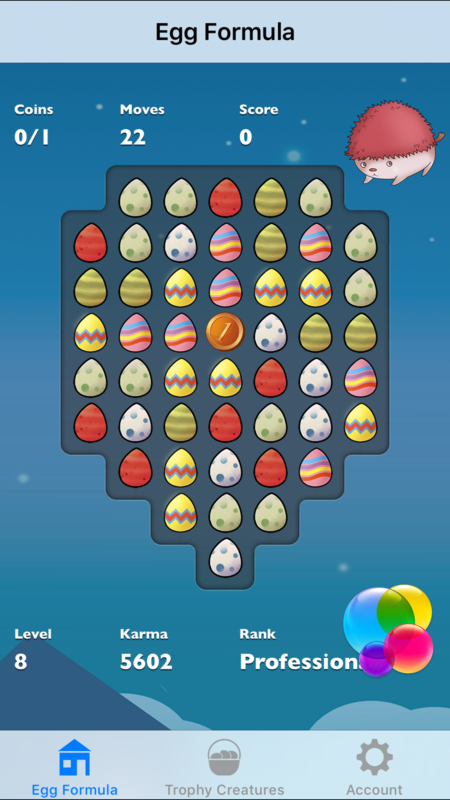 Magic egg might be earned by matching 5 eggs in a row or column. 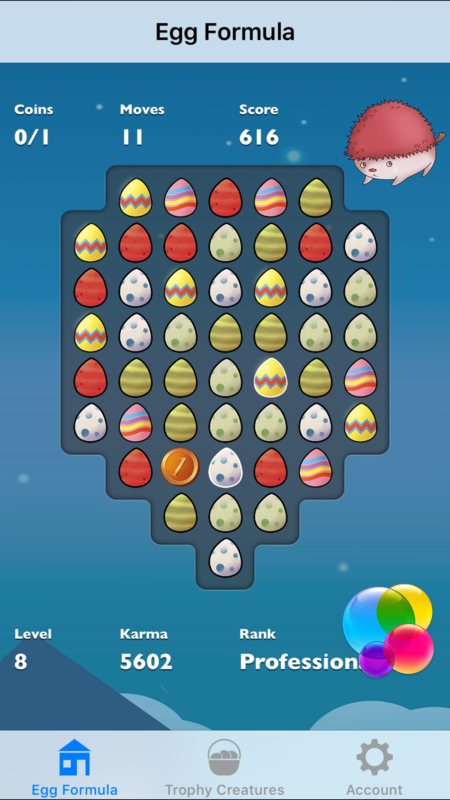 When you swap Magic egg with a regular egg, it destroys all eggs of the same color in a grid which brings many points. Special egg might be earned by matching 4 eggs in a row or column. Special egg has a white border. When you match 3 eggs and one of them is a Special egg the whole row or column of eggs is destroyed. T-chain and L-chain worth many points. You should always look for those type of chains. Ice is broken and destroyed if there is a destroyed egg underneath the ice. Walls are destroyed when the neighbour egg is destroyed. Wall grows if none of the walls was destroyed in the previous turn. Each completed level adds to your karma and helps you to advance through the game ranks and leaderboards. Your mission is to complete all levels, collect all trophy characters which are hidden behind certain levels and dominate the karma leaderboards on Game Center. Egg Formula is very easy to learn and can help you relax and fill the time while at home or waiting or commuting in a public transportation. Egg Formula is free to play but some optional in-game items may require payment.